This is a square No Spitting porcelain sign. This particular No Spitting sign is blue with white text. It reads, “Notice! 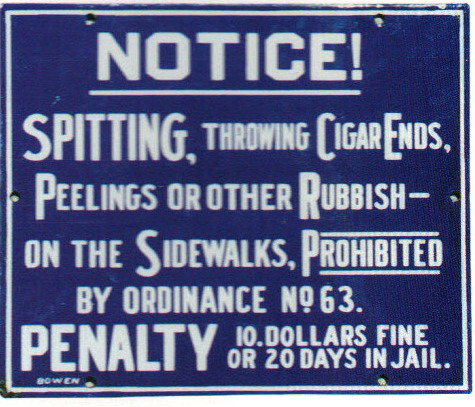 Spitting, Throwing Cigar Ends, Peelings or Other Rubbish – On The Sidewalks, Prohibited by Ordinance No. 63, Penalty 10 Dollars Fine or 20 Days In Jail”.